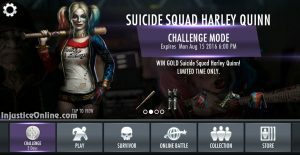 Suicide Squad Harley Quinn is the second Suicide Squad character from the Injustice Mobile 2.11 update to arrive as a single player challenge. 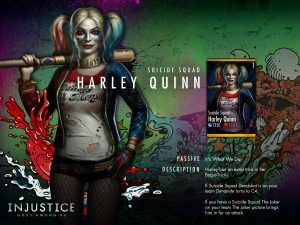 Dr. Harleen Quinzel was once a promising psychiatrist but following her descent into madness she became the formidable foe to good ol’ bats-y that you know now as Harley Quinn. 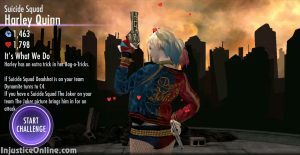 Description: Harley has an extra trick in her Bag-o-Tricks. 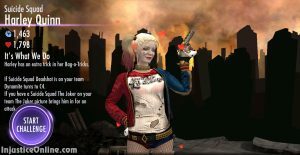 If Suicide Squad Deadshot is on your team Dynamite turns to C4. 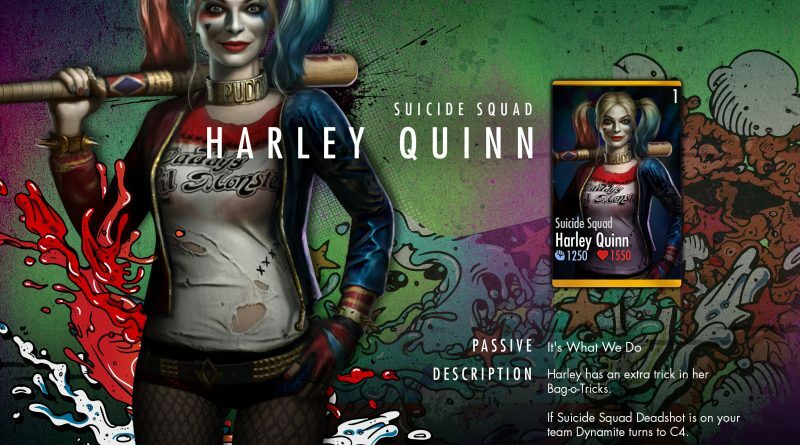 If you have a Suicide Squad The Joker on your team The Joker picture brings him in for an attack. 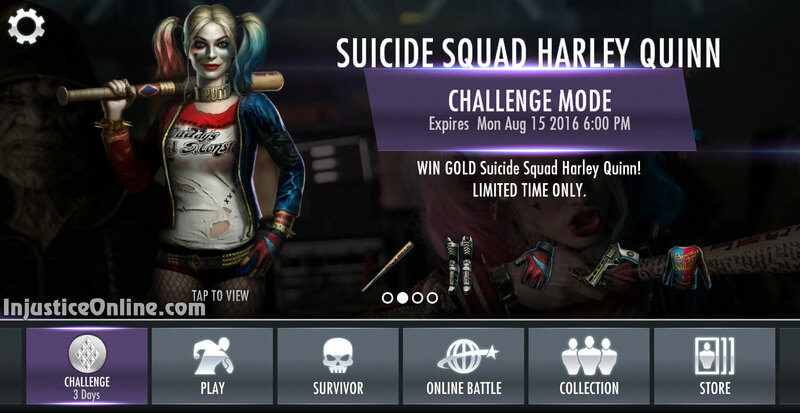 Just like the Deadshot challenge Suicide Squad Harley Quinn’s challenge is unique in several different ways. First, its first difficulty level is extremely accessible even for completely new players as it has no additional requirements, includes only 45 battles instead of the usual 63, doesn’t require challenge credits (this is also relevant for the other difficulty levels) and includes fairly easy opponents. It wouldn’t show up wwwwhhhhyyyy!!!!!!!!!!!!!!!! I hate this!!!!!! Hopefully yes. The Deadshot challenge has returned. Who knows, they might. 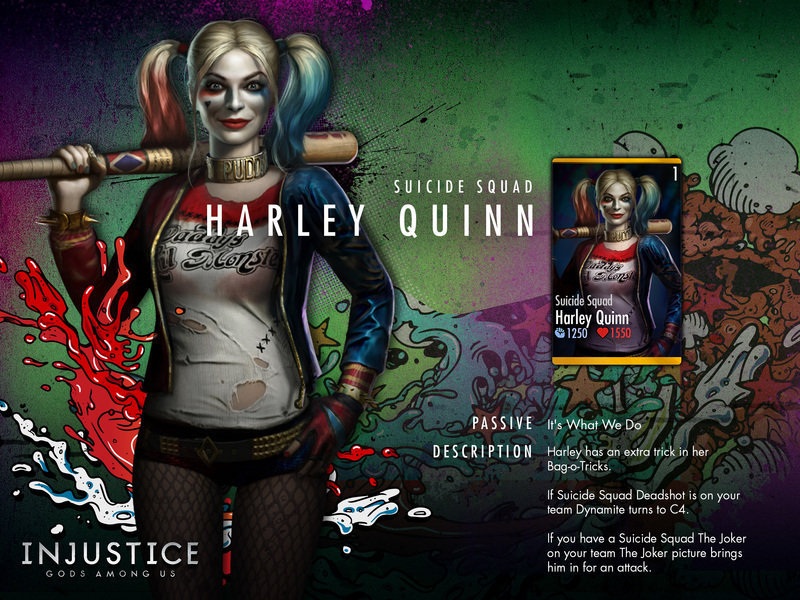 Or may be the suicide squad pack will become available at some point.